When a reader writes in, always respond to them with a personally written message, even if you get 50 emails in one day. 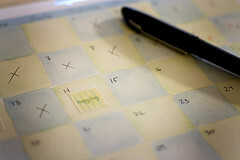 Don't respond by sending out a second newsletter. It's rude and makes you appear to not care about your individual readers at all. Your business will only be as good as the time and energy you put into it. “What do I hope to get out of this project? Honestly, I want to become a better quilter. I'm young enough to know that I'm pretty good, but old enough to know that pretty good isn't good enough, if you know what I mean. Leah does offer some quilting products via her other websites, and she is starting to sell her free motion quilting filler designs in packages of 20 (complete with book and optional DVD), but the free motion quilting filler design blog offers all of this great content for free. Free is an unbelievable marketing tool that any quilting business can use to great effect. 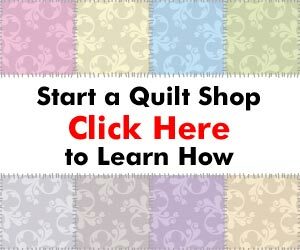 I do sell some quilting business books, but all the content on this site is free for anyone. I do this because it makes me feel good to give, and it also makes it more likely that when I do have something to offer the Quilting Business community, you will at least check it out to see if it's right for you. No pressure, and I don't mind if you never spend a dime because I don't do this solely for the money. And Leah offers her designs for free because she's learning and she enjoys giving back to the quilting community. You can check out the blog using the link above, and if you want to see what else Leah has to offer, check out her website at www.DayStyleDesigns.com. Leah may be young, but she's taught me a thing or two about marketing. I will do my very best to keep up with emails and respond as quickly as possible. I may be working on a few things right now, but there's no excuse for poor customer relations. So please feel free to call me out if you catch me not responding! I just got a letter from Chuck. He said you unsuscribed to his site. You are great, thanks for the tip to be kinder to our volunteers and helpers and let them know they really count. Sometimes a newsletter gets sent out instead of a personal message to our friends. Thanks for reminding me all of our people are people not just numbers. Thanks for reminding us that we need to be personal will all our corespondence to our customers and volunteers. I just got a letter from Chuck’s Quilting. I see you have a site for large cutting mats. I’m certain you don’t remember me, with all the folks you deal with. A couple of years ago you were giving away copies of your ebooks to folks who sent in special tips. I was one of those who one the three-book package. I think the tip was using old eye glass cases as rotary cutter holders. I downloaded the books and thought they were great advice. I wasn’t ready to use them as I hadn’t started my quilt business. Anyway, last year our computer crashed and took everything with it — the worst were photos and those ebooks. I thought I had copied them onto a disc, but either I did and lost it or I didn’t and they’re just gone. If your records show this, do you think you might see your way clear to send them again? I’ve avoided asking because I didn’t think you would, but I friend reminded me of that old saying, “Nothing ventured…” Anyway, here’s another tip that really helps in a pinch. If your pins and needles drag or stick going through your fabric, stick them into a bar of soap and dry-wipe the excess off. You can even do this with machine needles that drag after sewing through fusible webs. Any bar will do, but a moisturizing bar soap works best. Just don’t stick them in your mouth right after — the taste is awful! Thank you. I do remember, and I will definitely send you a link to download all of the books you won. I’ll send it to your email address attached to this comment.